This 6 day trek takes you to 3 Berber valleys each with a different landscape, flora and fauna. It also takes you through many of the mountain villages. The ultimate icing on the cake is the Toubkal summit trek on the second to last day. You will be well and truly fit by then and de-stressed form your daily routine. These mountains in the High Atlas are full of panoramic surprises as you trek between the valleys and meet the friendly, warm locals. You can get a sense of the community spirit here too and perhaps enjoy some local music or witness a wedding. Whatever you see or feel, you will remember for a long time to come. On the last day you can choose to stay the night in Aremd, Imlil or be driven to Marrakech. If you are continuing your tour with a trip to the Sahara then we will advise the itinerary. You will be picked up in Marrakech and transferred to the Ouirgane Valley by our team. You will meet the mule team there and pack up for the adventure. Trek from Ouirgane Valley through juniper and cork oak forests to the village of Tikhfiste. The view will be exceptional as a panoramic vista opens up of the two lake of Ouirgane and Lalla Takerkoust and the Kik Plateau. Lunch will be in the forest overlooking Ijoukak Valley and villages. After lunch and a rest, the trek will continue with the junipers being replaced by more sparse vegetation. Walk along a dirt trail will take you to the village of Assif Zerkzoun where we will spend the night in a local guesthouse. 6 - 7 hour walk. After breakfast we start the trek to Dkent valley. The landscape changes as geological changes over millennia become evident; greens become reds and yellows and the mountains become more deforested. Lunch at the halfway point will be near a picturesque stream before we reach the remote rural village of Tizgui in the Dkent Valley. Overnight in a local guesthouse. 6 - 7 hour walk. After breakfast, the days trek starts with a hike up towards M’zik Pass (2450m). 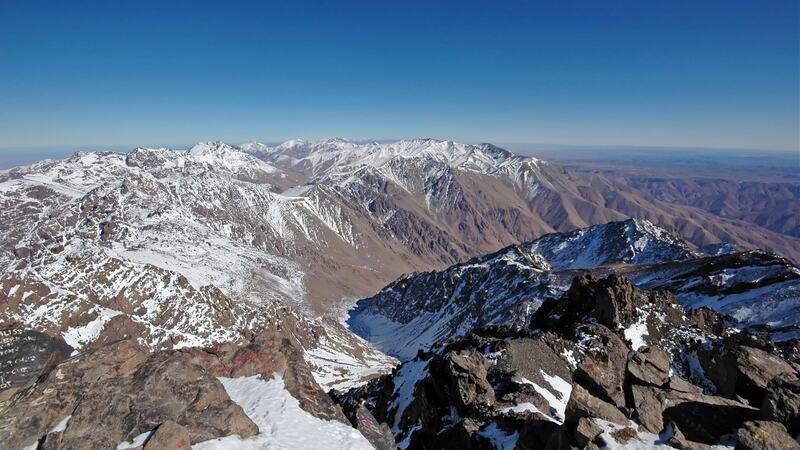 The pass offers wonderful views over the Imlil valley with its Berber villages. It will be also the place where you will stop for lunch. After, we have a downhill walk to Aberdoune spring. Then we will continue to the village of Aremd, which will be the place where you will spend the night. Trek starts around 9 am with walk up the Ait Mizane valley passing by the holy shrine at Sidi Chamharouch (2400m). Here you will stop for lunch, which will be prepared by our cook; we then carry on walking to reach the Toubkal Refuge (3207m) where you will likely be sharing a bunk room with other trekkers. Overnight in the refuge (3207m). After a 5am breakfast, we trek up to Toubkal Summit. We start with a steep single path on the east side above the base camp; a very slow and progressive walk to Tizi n’ Toubkal (4000m) where you can clearly see the summit, then another 30 minute walk on the ridge to reach Mount Toubkal summit, which will provide marvelous moments observing the silent beauty of the rocks lit up with the sun’s first rays. Afterwards, we trek back down to the hut for lunch and walk all downhill passing through Sidi Chamharouch along a rocky trail all the way to Aremd village. You can choose whether you would like to spend the night in our lodge in Aremd, spen night in the village of Imlil, or be collected in Imlil and driven to Marrakech. Additional services and Tours around Morocco on request.